PM Modi should be lauded for the efforts that he is putting in to make India an industrial hub and generate jobs for the rising young population. 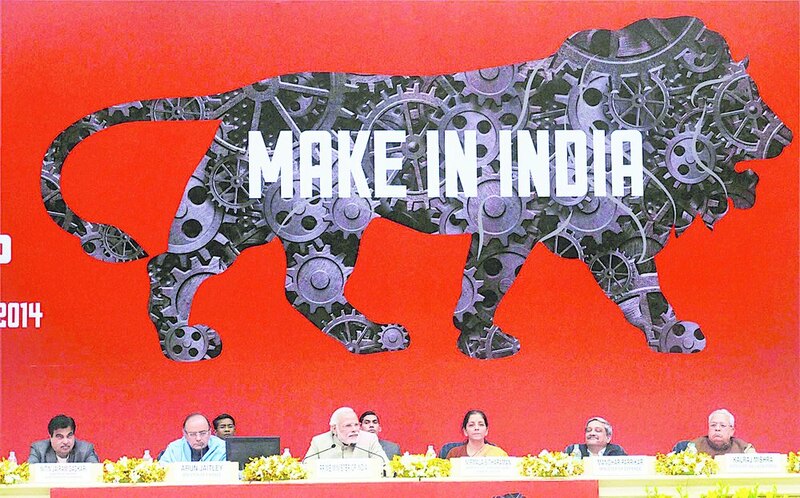 But the efforts beg a question, whether Make in India will work as a policy and achieve desired objectives i.e. increase share of manufacturing and generate jobs? Given current regulatory environment, the answer seems no. Lets explore why. India is an outlier when it comes to structural change (i.e. change in shares of manufacturing, agriculture and services over time) of the economy. At Indian level of per capita GDP, most countries would have a higher share of manufacturing rather than services. India is different because it directly jumped from high share of agriculture to services sector, bypassing the growth in manufacturing sector as an intermediate step seen in the case of most developing economies. Thus India missed on pulling out its masses from agricultural sector, which is reflected in the right panel of the above figure. Although, services contribute more than 50% to Indian GDP, it employs a much smaller proportion of population. On the other hand, manufacturing share has remained almost constant in terms of GDP, but it now has slightly higher share in employment. Make in India initiative should be seen in this context to correct the historical bias in Indian growth story and revive manufacturing sector to generate jobs on mass scale as it happened in China. Indian regulations have been blamed for this lop-sided growth or rather non-growth in manufacturing sector. So, the question now is- can Make in India style initiatives give a boost to Indian manufacturing. To understand this we need to look at the basics without getting carried away by Modi’s hard work and intent in achieving this objective. Although structural change can be caused by preference or income changes in population, but at India’s level of per capita GDP, we can rule them out. So we have to look at supply side story and understand why manufacturing did not pick up in India and whether current government has changed anything on the ground. A lot of columnists talk about massive bureaucratic red tape for hampering manufacturing growth but there are three important ingredients which stand out. For any sector to flourish, one needs to look at the input requirements for any sector. The inputs are basically three- capital, land and labour, which are often called factor markets. So, lets look at the current situation of factor markets in India. 1) Capital– is needed for setting up any industry. Capital markets have been relatively free and open in India. There is a well developed stock market as well as banking services to infuse capital into new firms. But what is the current situation on the ground. The banking sector which forms the core of this factor market has been brought to its knees due to unscrupulous lending to crony capitals. The public sector banks are in dire need of massive capital infusion without which they cannot kick start the lending cycle. The bad plus restructured loans form 17% of total assets of public sector banks. The above figure means that an otherwise healthy sector is not working well in the country. So, one can forget about firms investing in new projects given that banks are not in a position to take risk and lend any money. Modi’s initiative to court foreign investors with deep pockets can ameliorate this problem to some extent but FDI/FII are not going to reignite the investment in the whole economy. Summary- Capital market is unhealthy. 2) Land– is another crucial factor, but unlike capital it is highly regulated in India. Given problems in land acquisition, serious businessman who do not have deep pockets to bribe the establishment cannot set-up any industry. This factor market impeded the growth of manufacturing sector because it needs to acquire massive tracts of land unlike services sector. The Land Acquisition Bill passed by the last UPA government delivered the final nail in the coffin, which has now made acquiring land a gargantuan task, an almost impossible feat for any small investor to achieve. Since Modi government could not pass the modifications to the current land bill in the last few Parliament sessions, it means the land market is completely strangulated at the current moment. Given policy uncertainty and huge costs involved in acquiring land, no serious player would put his money in manufacturing, which is massively dependent on land. Unlike in case of capital markets where Modi is courting foreign investors, the government does not seem to do enough to improve labour market. Probably land acquisition model of Naidu in Andhra Pradesh can provide some hints to Modi government on how to bypass this deadlock but they are all quick fix rather than long term solutions. Summary- Land market is as unfriendly as under UPA. 3) Labour– is the third main factor market and is again highly regulated. Massive number of regulations kick in once a firm crosses employment thresholds. This along with firing costs make it almost impossible for any firm to shut down loss making operations, thus putting a break to the process of creative destruction, an important ingredient of market economy. Take a look at the above figure to see a discontinuous decrease in number of enterprises with 10 employees. Since, many labour regulations kick in at 10 employees, this sharp decrease in number of enterprises is not a surprise. Another important drawback of these labour regulations is that it has forced manufacturing sector to automate stuff which has made this sector highly capital intensive, which again means there would not be enough employment generation even if firms figure out how to invest and acquire land. The above figure shows the ratio of value added in GDP by labour intensive sectors (which use more labour) vs non-labour intensive sectors (which use more machines) in India. What clearly stands out is that at India’s level of per capita GDP, the share of labour intensive sectors is too low i.e. firms use more capital instead of labour. China at four times per capita income uses same labour mix as India. This should not be a surprise that given labour regulations in India, not only firms invest in capital intensive sectors like automobile etc, but they also try to replace labour with capital as and when possible. Sadly, beyond the slogans Modi government has not passed any game changing laws for labour deregulation either. Even if Make in India initiative picks up, it is highly unlikely that new firms will invest in labour intensive sectors with the end result that there won’t be enough employment generation. Rajasthan government under Vasundhara has shown some interest in changing these regulations, but central government has shied away from pursuing these issues. Unless trade unions and other vested interests are taken head-on to bring these changes, it is highly unlikely that India can generate enough jobs for its youth. Summary- Labour market is strangulated. Given these deep problems with factor markets, it will only be a miracle if Modi can deliver ten million new jobs every year through his Make in India initiative. The fundamentals are wrong and it will be plain stupidity to expect otherwise. While big conferences are a good PR exercise, but sadly they cannot replace serious policy changes. Everyone knows that BJP does not have a majority in Rajya Sabha, but “Reforms are the art of the possible” as stated by Arun Jaitley on multiple occasions. Hopefully, Modi government will learn this art before it is too late.